Offices, Classrooms, Research Labs, Gym and Locker Facilities, and other Buildings with InstaKey as standalone mechanical door access, and as mechanical key override for card access system. University of Maryland Building Management is responsible for the physical security of all facility management. In late 1999, Building Management experienced an incident with a lost Master level key for a campus facility. The resulting cost in material and labor to replace all cores and keys under the compromised Master level key prompted the University of Maryland to begin seriously considering alternatives to their existing mechanical key system. InstaKey’s Key Control Solution was among the systems reviewed and considered. 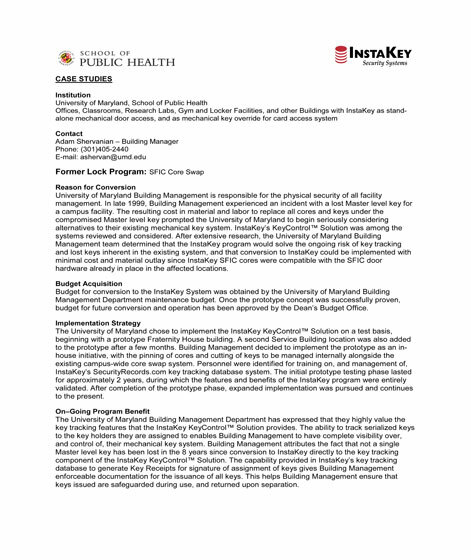 After extensive research, the University of Maryland Building Management team determined that the InstaKey program would solve the ongoing risk of key tracking and lost keys inherent in the existing system, and that conversion to InstaKey could be implemented with minimal cost and material outlay since InstaKey SFIC cores were compatible with the SFIC door hardware already in place in the affected locations.